Kevin:Thank you for your comments. Since you posted, I’ve been out and about and I’ve had a chance to speak with a few friends who were Vietnam veterans. The overwhelming response to my gentle questioning regarding draftees is this: they felt like their rights were being violated, like they had no choice in the matter. They were forced to go and fight in a war that they did not believe in, saw no use for, and did not see how it profited the United States. A card showed up in the mail, telling them where to report, and if they did not, they were hunted, arrested, at times imprisoned, and then forced into the service. As I have already stated, my connection with the Clyburn family was limited to just a few minutes. I would like to talk with them further if the opportunity ever comes up. As far as research goes, my work into the lives of the Cousins brothers (sometimes spelled Cozzens , sometimes two or three other ways) has used entirely primary research, i.e., letters, census records, newspaper clippings, etc. The Cousins were never slaves, they were free persons of color, who volunteered in the fall of 1861. How do I distinguish between a slave and a soldier? A man who picks up a rifle (or musket) and who under orders fires at another man who is perceived as a enemy, is a soldier. It has nothing to do whether he is there of his own free will, or if his service is compulsory. And it technically has nothing to do with his position within said army. He could be a cook, supply officer, or on recruitment duty; his service should be honored. Richard: You’re absolutely right. So often, the opinions of the descendants of a honoree are deemed immaterial. The honoring of a person of color for his Southern service does not seem to fit within the framework of “accepted” Civil War scholarship. When is academia going to realize that the racial makeup of a Confederate regiment does not fit within a “black and white” framework? If I can find two free persons of color who voluntarily shouldered muskets in North Carolina’s smallest county (population/slave/free), imagine what else is out there. Some folks have probably wondered why I have not yet commented on all of the ink being spilt regarding Union County’s Weary Clyburn. I had a chance to attend the memorial service a couple of weeks ago for Mr. Clyburn, but chose not to. I did have the opportunity to talk with the family. Since several other very thoughtful and intelligent writers have already presented excellent articles on this subject, I don’t wish to become a mere redundancy. It is exciting to see lively and respectful debate between smart, creative individuals. I only have one concern that has not already been nicely handled by some of my distinguished colleagues. My position on the matter of blacks, both slave and free, serving within the Confederate army is simple. Were there tens of thousands of black Confederates? No. Were there some? Yes. If you have kept up with my blogging over the past year and a half, you know of my own researching into the matter, namely the story of the Cousins brothers. What puzzles me is this: we honor those who were conscripted to fight (and did so honorably) in both the Confederate and Union armies. We honor those who were drafted into the service for other wars, like WWII and Vietnam. Why should we not honor those who were camp servants, teamsters, cooks, etc? The tens of thousands who were drafted and sent overseas to fight in Vietnam did not want to be there. They were forced into the service, yet we engrave their names (and rightfully so) on the same wall as those who volunteered and were killed. What is the difference? I don’t imagine that any of us today will be able to come up with an easy answer to this complex problem, but it does stem from a heartfelt passion that motivates many individuals and groups: to see that all veterans, regardless of the level of their service or even their means of entering such service, are recognized and remembered for their sacrifices. McRae College as part of their John B. Stephenson Appalachian Lecture series. Inscoe is the author of several important texts on the Civil War in our region, most notably Heart of Confederate Appalachia and Mountain Masters, both of which I have found to be incredibly helpful in my research and writing. His topic was Women and guerilla warfare in Civil War Appalachia. While he covered a great deal of ground, he focused on a few critical events: the story of the Blalocks, the murder of Isaac Wilson, and the Shelton Laurel tragedy in Madison County. Unfortunately, when the time for questions came at the end of the event, some poor misguided soul was singing the praises of Rebels in Blue, the fabricated account of the Blalocks that was actually pulled by the publishers after it became clear that the author had created information out of whole cloth and credited them to non-existent sources. Dr. Inscoe handled the question gracefully and was a delightful speaker. If you ever get a chance to hear him, take it. If not, do read his books, which are important to any comprehensive understanding of the war in Appalachia. I spent the weekend (Thursday through Saturday), selling books and talking to folks at the national reunion of the Sons of Confederate Veterans, held this year in Concord, North Carolina. I greatly enjoyed talking with the scores of people who came by my table. Many of them shared bits of their own family histories for future projects. This Wednesday evening at 7:00 pm at Lees-McRae College in Banner Elk, Dr. John C. Inscoe will be lecturing on Appalachian Women and the Civil War. The program will be held in the Evans Auditorium in the Cannon Student Center. Inscoe is the author of The Heart of Confederate Appalachia: Western North Carolina and the Civil War, and Mountain Masters: Slavery and the Sectional Crisis in Western North Carolina, among many others. Inscoe is a Professor of History at the University of Georgia. This program is free and we are looking forward to it. Interest article on "Last Confederates" recently appeared in the Statesville Record and Landmark. You can check it out here. Interesting, the author never makes mention of Sam Bennett, reportedly North Carolina’s last Confederate. I got to visit his grave about a week ago. I’ll post more later. One of the articles that I read recently was David Keehn's "Strong Arm of Secession: The Knights of the Golden Circle in the Crisis of 1861," found in the June 2008 issue of North and South. Familiarity with the Knights of the Golden Circle might have come from the recent movie National Treasure: Book of Secrets, in which members of the order appear in the first few moments of the flick. Keehn makes mention of meetings of the Knights in Raleigh on May 6, 1860. Since Keehn is diving into an area of the war that has received scant attention, I'll not comment on the subject of the Knights and their impact on the Tar Heel state and the secession crisis. It is not that I don't find the subject interesting, it just not something that I have studied. However, I will comment on this: Keehn writes about Knights founder George Bickley serving as a surgeon in the 29th North Carolina in "early 1863." Keehn does not have a source for this information. I checked the roster for the 29th NCT, and found no Bickley. I also checked NPS's Soldiers and Sailors. The only George Bickley listed served as a private in Company D, 19th Louisiana Infantry. I did some additional digging and found this passage in a book entitled Dark Lanterns: Secret Political Societies, Conspiracies, and Treason Trails in the Civil War by Frank Klement. Bickley evidently served in Bragg's army for several months, for on June 10, 1863, he signed a voucher for pay from January 28 to June 9, as "surgeon, 29th N.C. Rgt." Evidently, however, he deserted and returned to the Shelbyville sector where he had been earlier living with a backwoods belle who had borne him a child. In a letter dated June 22, 1863, while he was supposedly serving as a surgeon in Bragg's army, hestated that he was "in the society of his family." The "Records of the Adjutant General" is the source for this information. By July 1863, Bickley is in Indiana. Is it true that Bickley served in the 29th NCT? Don't know. But it would seem to me that he would show up on more than one pay voucher if he had served more than six months. We will need to do a little more digging. David Corbett recently wrote: "I read your post with interest ! I have read that a Major Barry of the 18th ordered the firing and also many years ago read an article in which Lt. George Corbett of the 18th ordered the firing .... What are your thoughts , sir ?" My thoughts - as hard as I have thought about it, I don’t think that I ever heard anyone but Major Barry ordering the men to fire. After the first volley by the 18th NCT, an officer came forward, possibly AP Hill, yelling "We are friends! Cease firing! Major Barry retorted with "It’s a lie! Pour it into them, boys!" and an even greater fire was opened upon the Confederate horsemen. Was there more than one officer in the 18th NCT ordering his men to fire? Undoubtably. It is possible that one of those officers was Corbett of Company E? Yes, it is. Corbett was a first lieutenant at the time and remained in that position for the rest of the war. Barry was promoted to colonel on May 27, 1863. His promotion was "back-dated" to May 3. He was assigned command of the brigade after Lane’s wounding. Many believed that Lane would not return. 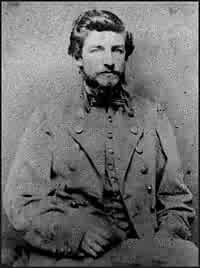 Barry was appointed brigade general, but before his appointment could be confirmed, he was wounded in the right hand (July 2, 1864). Lane returned, and Barry’s appointment was cancelled. Barry was in command of the regiment at the end of the war and was paroled in Raleigh on May 12, 1865. After the war, Barry returned to Wilmington and was editor of a newspaper. He died March 24, 1867. He was 27 years old. Some of his friends and family said that Barry "died of a broken heart" for his role in Jackson's death. I’ve spent the past couple of days trying to get caught up on my magazine reading, which I have neglected in my efforts to finish the Mitchell County book. A couple of things have caught my attention. In the current issue of America’s Civil War, Stephen Lunsford of Alabama writes in, commenting about an article written by Ernest B. Furgurson on Jackson’s mortal wounding at Chancellorsville. "Was the 18th North Carolina cursed after mortally wounding Jackson on May 2, 1863?" Lunsford writes. "The day after Jackson was shot, the 18th North Carolina fought units of the Union XII Corps south of the Plank Road. The regiment’s commander, Colonel Thomas J. Purdie, was killed; Lt. Col. Forney George was wounded, and Corporal Owen Eakins, the color bearer, was killed and his flag captured by the 7th New Jersey. Overall the 18th North Carolina lost 34 killed, 99 wounded, and 21 missing... At Gettysburg, the regiment lost 88 of 346 men. At the Wilderness, a year after Chancellorsville on the same ground, the 18th North Carolina was routed south of the Plank Road. On April 2, 1865, the unit was hit hard by the Federal assault that broke the lines at Petersburg. The 18th was forced to withdraw, and the regimental colors fell to the 40th New Jersey. The regiment surrendered a week later at Appomattox Court House with 93 men under Major Thomas Wooten." Does the 18th North Carolina deserve the bad reputation with which it has been labeled? First, the 18th NCT was not responsible for the wounding of Jackson. It was dark. Jackson had ridden out about the time that the regiment had gone into line to the north of the Plank Road. They did not know he and his staff were there. The Tar Heels of Lane’s brigade could hear the Federals working, building breastworks not far away. There was a lot of firing going on, both small arms and artillery, by both sides. The woods were smoking, the vegetation thick, and the debris of battle littered the woods. This debris undoubtably included dead and wounded Federal cavalrymen and horses from a failed attack earlier that afternoon. The Tar Heels of the 18th NCT certainly had those dead troopers on their minds. There was firing on the right. Fellow Tar Heels in the 37th North Carolina fired first on Jackson’s party, killing at least one and wounding a couple. This drove Jackson and his party across the Plank Road and in front of the 18th NCT. The men of the 18th NCT could hear the horses in the woods, trying to navigate in the darkness. No one had told the 18th NCT that Jackson was there, and as his party neared their lines, they opened fire, wounding Jackson and others. If it was anybody’s fault, it was Jackson’s. And as much as I like Jackson, and admire his abilities as a battlefield commander, it was a foolish thing for him to scout ahead of those lines, in the dark, on May 2, 1863. As far as Mr. Lunsford’s other thoughts, yes, the regiment was again hard pressed, this time losing more men than any other regiment in Lane’s brigade, However, compared to the action seen by others, like Pettigrew’s brigade, well, the 169 men lost by the 18th NCT is a small loss in comparison. Yes, the 18th NCT was routed at the Wilderness, along with a lot of other regiments. Mr. Lunsford fails to mention that a week or so later, the 18th NCT captured the flag of 19th New York Light Artillery at Spotsylvania Court House. The 18th NCT was a part of a charge, largely involving Lane’s brigade, that stopped Burnside’s IX Corps. Had Burnside not stopped, he likely would have crushed the Confederate defenders along one side of the Mule Shoe (actually just a little lower along the line). At Petersburg on April 2, the 18th NCT’s section of line had been so depleted of men that the ones left were on average 10 feet apart when the Federals attacked. With so few defenders, collapse of the line was all but a forgone conclusion. I think that the 93 men who surrendered with Wooten on April 9, 1865, are more of a testament to the hard-fighting 18th NCT, than a curse for shooting Jackson. I am delighted to report that today I sent in the manuscript for Remembering Mitchell County, my fourth book for Arcadia and my ninth book total. I have now written about four of the state's counties. Do you think I'll get to yours?